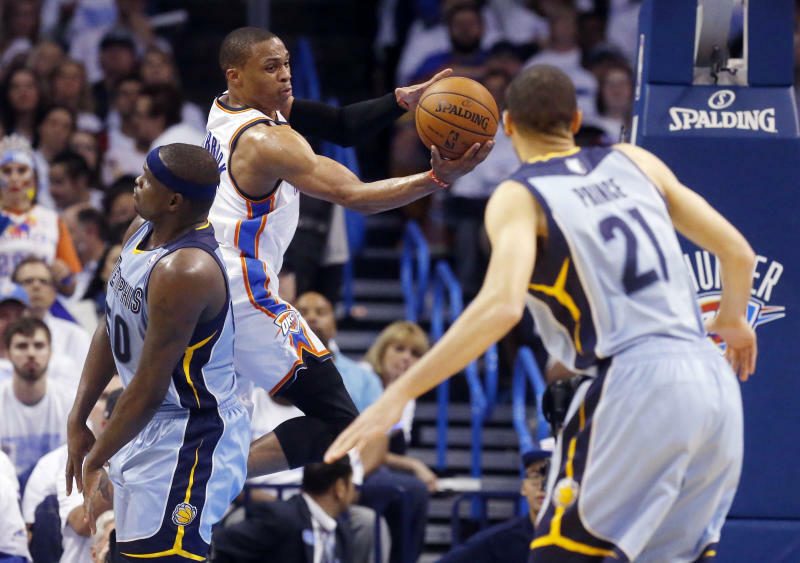 OKLAHOMA CITY (AP) — It took a fraction of a second for the Memphis Grizzlies to take control of their first-round series with the Oklahoma City Thunder. With 2.9 seconds remaining in overtime, Oklahoma City's Kevin Durant missed a long 3-point attempt. 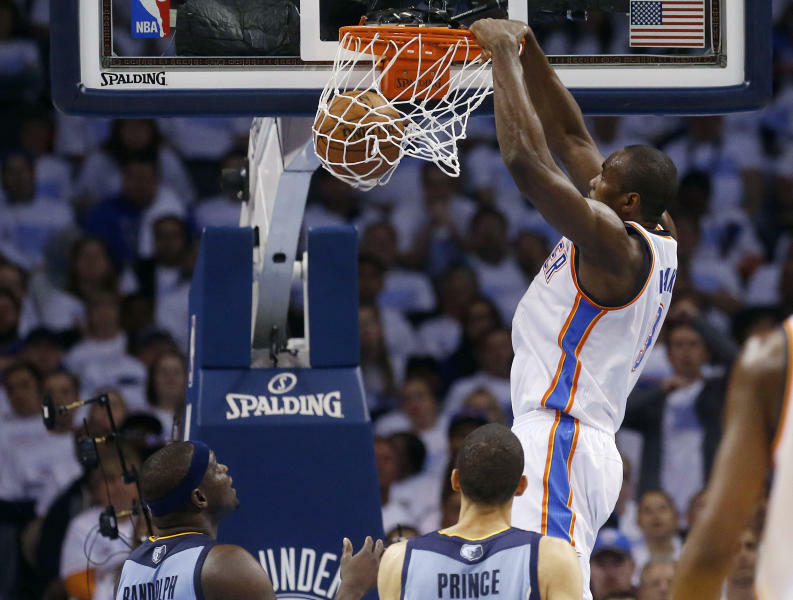 Teammate Serge Ibaka tipped the ball in on the rebound, sending the crowd into a celebration. The shot was reviewed, however, and it was determined that it was released just after the buzzer, giving Memphis a 100-99 victory Tuesday night and a 3-2 lead in the series. "I had a good look at it and I thought it was good when it left my hand," Durant, the NBA's scoring champion, said. "And then Serge's follow shot was just late. It was a tough finish but we've got to come back." It was a record fourth straight overtime game in the series, and Memphis has won three of them. The seventh-seeded Grizzlies can close out the second-seeded Thunder on Thursday night at home. "Nothing comes easy for us," Grizzlies forward Zach Randolph said. "We get it out of the mud, we grind and we're underdogs. It's what we do." Before the final overtime sequence, Durant made the first of two free throws with 27.5 seconds left to cut Oklahoma City's deficit to 100-99. Before his second shot, referee Joey Crawford took the ball from Durant and walked over to the scorer's table. Moments later, Crawford was screaming at the scoreboard operator, asking him to make a change. After the delay, Durant, an 87 percent free throw shooter during the regular season, missed the second attempt. "I'm not sure what happened, but I've got to focus and I've got to make that foul shot," Durant said. The Grizzlies didn't understand what was going on, either. "We just looked at Joey and we were like, 'What is Joey doing?'" Memphis guard Mike Conley said. Mike Miller scored 21 points, Randolph had 20 points and 10 rebounds and Conley added 17 points for the Grizzlies. Russell Westbrook had 30 points, 13 assists and 10 rebounds for the Thunder, but he made just 10 of 31 shots from the field. Durant scored 26 points on 10-for-24 shooting. He has struggled throughout the series, but Thunder coach Scott Brooks said he's not worried. "He's going to get his shots and he's going to make his share," Brooks said. "He'll get himself ready for the next game." Overall, the Thunder shot just 39 percent. The Thunder, one of the league's most potent offensive teams in the regular season, have shot below 40 percent in four of the five games in the series. 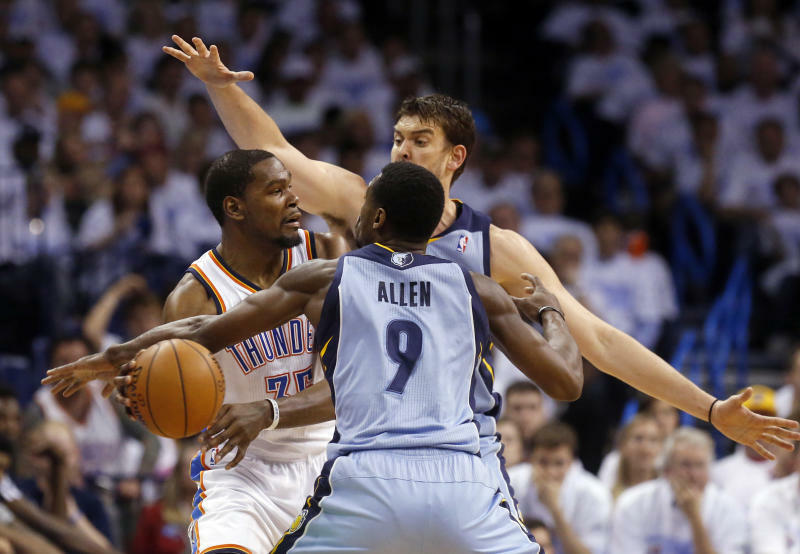 "We understand this team very well," Memphis guard Tony Allen said. "We've been playing against this team the last four years with this group. We understand their plays, we understand who they're trying to run their offense through. We know Kevin Durant is going to take his shots and Russell Westbrook is going to take his shots. We have to contest those shots and stick to our defensive coverages for 48 minutes." Oklahoma City trailed by 20 points in the third quarter but trimmed its deficit to six by the start of the fourth quarter and finally took a 79-78 lead on a 3-pointer by Durant. Memphis maintained its composure. Consecutive baskets by Conley put the Grizzlies up 87-82 with just under 4 minutes to play. Oklahoma City's Caron Butler was fouled by Randolph as he hit a 3-pointer with 2:40 to play. He made the free throw to cut Memphis' lead to 87-86. Oklahoma City, trailing 89-88, had a chance to take the lead in the final minute of regulation, but Durant was stripped, and the ball was stolen by Conley. Allen made the first free throw with 30 seconds left. He missed the second, but Marc Gasol of the Grizzlies got the rebound with 20.3 seconds to play. Conley was stripped by Westbrook, and Westbrook dunked with 4 seconds left to tie the game at 90. Memphis didn't get a shot off in time at the end of regulation and the teams went to overtime again. Miller hit two early 3-pointers in the extra period for the Grizzlies. "Defensively, we made a few mistakes at the end of regulation," Gasol said. "But we came out in overtime, made a couple of 3s, and that gave us a big lift in confidence. We were able to manage it and control from there." NOTES: The Grizzlies wore their warmups inside out and the Thunder wore black socks and shoes in protest of Los Angeles Clippers owner Donald Sterling's incendiary racial remarks. ... The Grizzlies shot 60 percent from the field in the first quarter to lead 30-25. ... Oklahoma City made 6 of 9 3-point attempts in the first half, but just 9 of 34 shots inside the arc. ... Tulsa Shock guard Skylar Diggins attended the game.